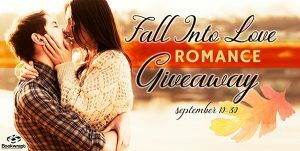 Want a chance to win a Kindle Fire7, ebook prize pack, or Amazon gift card in the Fall into Love Romance Giveaway? Between quaint country inns, falling leaves, and weather that invites snuggling, nothing tops fall for sheer romance. And I, and a bunch of other awesome romance authors, are holding an all-genres romance giveaway to celebrate the season.